Yeah, but: Incidentally, the card does work. The Long Version: The Eye-Fi card seems so promising – photos wirelessly zipping from the camera to the computer, no cables, and no hassels. Ah, if only it was that simple. The card can't be used without being registered, so the first step is to install the software and connect to the web server. This is 2011, and something as simple as creating a login ID shouldn't be a huge challenge. Supply an email address, type in the chosen password twice, and Robert's your mother's brother. Again: if only. Following the supplied start-up instructions, I installed the included Eye-Fi Center software, upgraded to the latest version over the internet, and then I was greeted by the New Account screen. When I chose a password I was told that it couldn't be used, but no reason why. I'd try a different one, and then I'd be told that the card couldn't be initialized and would need to be ejected and reinserted. And again. And again. Different email addresses, different passwords, or any combination of information just failed over and over again with cutsey little error messages that remind me why I hate Flickr. On a lark I tried the "Forgot your Password?" option, and it accepted one of my email addresses and sent me a reset link. Okay, now we're in business – don't know how, don't know why, but it's progress. I used the supplied link to change my password (to one that I was trying to use all along) and got into the manager program and registered the card. It wanted to update the firmware on my card, and as Garfield once said, if the rope's around your neck you might as well jump off the horse. I start the firmware update, am told not to remove the card, and then my computer tells me that the card was improperly ejected. Extremely worried that "I" might have just turned my expensive Pro X2 (now with twice the Pro!) Eye-Fi card into an ineffective paperweight, I logged back into the software service. Or at least I tried to: it wanted to do the bad password / reinsert card dance again, as it insisted that the card was unregistered and there was no possible way I could already have an account. After a couple more attempts to log in I gave the old "Forgot your Password?" trick another try. This time it swore it had never heard of me and refused to accept that I had ever existed. I honestly don't remember what eventually worked. I spent a lot of time reading through the support forums, where pretty much every problem – and a lot of them sounded familiar – was met with a request to contact customer service. I formatted the card a couple of times and did a little dance, but essentially it eventually just worked when it wouldn't work before. It's not like I had that many options, or found some secret passcode: I wasn't really doing anything wrong, so there was nothing for me to fix. It just wouldn't work. I bought the "Pro X2" model for two reasons: it transfers raw files as well as movies and jpegs, and it can link directly to a computer without needing to join a larger wireless network. The second feature is a no-brainer. The point of a wireless connection is convenience and spontaneity; if I have to return to (or establish) a trusted network with a router then connecting while away from home becomes anything from difficult to impossible. I took and edited the photos for this review on my lunch break, which wouldn't have been possible without the direct-connection Ad Hoc feature that's only available with the most expensive Eye-Fi card. This is such a fundamental ability that the less expensive cards are just as hard to endorse as the most expensive one – there's no 'sweet spot' on the price/performance curve. The other feature that's unique to the "Pro X2" model is the ability to transfer raw files. But here's my problem: the Eye-Fi Center software configures the card, and can't be set differently for different computers. I don't want raw files going to my laptop, which is slow with a small hard drive and itty-bitty screen, but having my GH1 automatically transfer its files to my Command Centre desktop while I'm still taking photos is really useful. My options are to either format the card before and after each use, and only have one computer running at a time to stop the card from transferring the same files to each one, or to accept that I will have to hunt down and delete the photos that I don't want to have littering each different machine. This wireless thing is far less handy than I thought it would be. *sigh* I wish you'd said something before doing this, I would have flagged you off. But then you wouldn't have written another enjoyable review. I guess you have to suffer for your art. You can always wait for the "Pro X3." prologue, I've been waiting for an increase in my Pro level for longer than I care to admit. 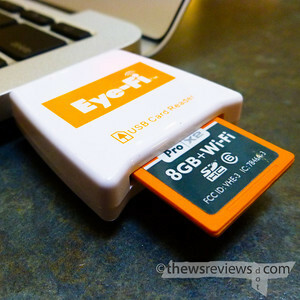 Matthew, thanks for posting your review on the Eye-Fi Pro X2. We are very sorry for your frustrating experience. A lot of the early setup issues seem to suggest a faulty USB reader. We will reach out over email to get that replaced. Currently, you can only select one computer at a time, so you can't have JPEG photos go to computer A and RAW files go to computer B as you point out. I have added that to our feature requests list. Randhir, thanks for the response. I appreciate it, and the fact that you found this little review blog so quickly reflects well on the attention that Eye-Fi pays to its customers. The Direct Mode certainly looks interesting, but it seems that Eye-Fi is incorporating an ability that was already provided by (unofficial, unsupported) third-party software. The emphasis on 'mobile devices' certainly suggests that the feature won't be extended to connect the Eye-Fi card to wifi-capable computers. Hopefully my interpretation of the information that I've found is incorrect, as extending a de facto ad hoc ability to the rest of the line would still leave the Pro X2 differentiated from the other X2 cards by its ability to transfer raw files. 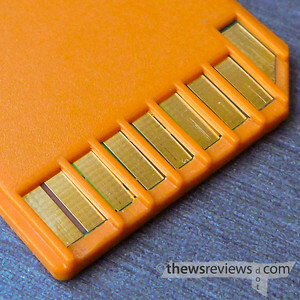 If I was able to create an ad hoc / Direct Mode connection to my laptop with a 4GB card that cost about half of what my Pro X2 did, I would happily buy it as well. But without that ability, the alternative to the most expensive Eye-Fi card isn't another Eye-Fi product, it's the cable that came with the camera for free. That's a pity, because I like the card and find it useful despite its frustrating feature set and requirements. 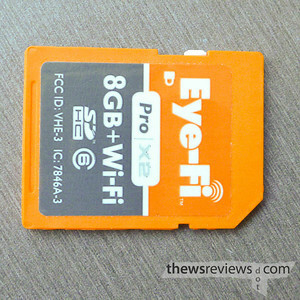 I'm looking forward to seeing how the Eye-Fi cards evolve.